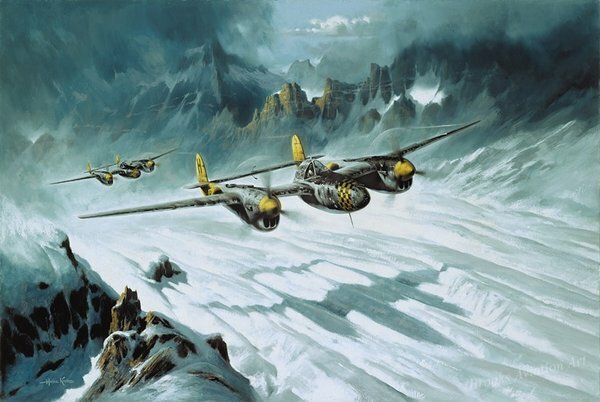 Overall size: 19" x 27"
After combat with Luftwaffe fighters over southern Germany, a pair of 82nd FG P-38s return to their bases south of the Alps using the mountain passes for a low level route into Italy. In the winter of 1944/45 the 15th U.S. Air Force fought its way further north into Germany from its bases in Italy over the Alps, a massive mountain range which separates the northern and the southern parts of Europe like a giant barrier, thus making an impressive natural wall of defence. It was across these mountains that the pilots of the 82nd Fighter Group flew on a day-to-day basis in a succcessful effort to establish air superiority over the southern parts of the Reich, thus preparing the way for the Allied ground forces. These missions were extremely dangerous due to the alpine terrain. Often, when bad weather blocked the escape routes back to Italy, or particularly when the planes had been exposed to hostile fire resulting in a further reduction of the fighters´ performance at altitude, the only way for the pilot to survive was to bail out over enemy territory. Therefore it was considered crucial for the fighter pilots to familiarize themselves as best as they could with the geographical features of this mountain range in order to find their way back to base through the mountain passes should that situation arise.